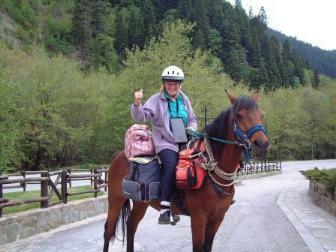 Penny Turner, an Englishwoman who lives in Greece, has just ridden 1,000 miles round that country on her horse, George. Long Rider Jeremy James wrote to tell us, "Penny is a very old stager and in the years she has lived in Greece has had just about every traveller on a horse stay with her from Adnan Azzan with his Arabs to Evelyn Coquet, to Tim Severin, and everyone else going to Jerusalem and back on a horse. I stayed with her, too. Now at long last she has completed her 1,000 miles." Congratulations, Penny, on what must have been a challenging journey in Greece's mountainous terrain.